Artificial Intelligence (AI) is defined as machines that approximate, mimic, replicate, automate, and improve human intelligence. AI allows computers to solve problems, interact with humans, and create ideas. Technological progress in big data, algorithmic development, connectivity, cloud computing, and processing power have made the performance, accessibility, and costs of AI more favorable than ever before. The term “AI” was coined in 1956 by a Stanford computer science professor, and now, over 70 years later, we’re just starting to see the promise of AI become real in a variety of industries—including logistics. Autonomous vehicle technology may seem like science fiction, but scientists have made progress over the last few years with self-driving trucks. Many industry leaders look forward to the capability, especially to help solve the truck driver shortage that continues to affect logistics operations in the U.S. Warehouses and other logistics hubs need to conduct regular quality inspections, but human-led inspections are often time-consuming and cause downstream inefficiencies. An AI solution holds the promise of accelerating inspections based on machine vision, using a set of automated image-based technologies. Machine-learning algorithms can improve the accuracy of machine vision-based inspections by learning what a normal product without any defects looks like through repeated exposure to the data. Some studies have found that existing deep-learning-based image recognition systems already have the potential to decrease human effort by over 70 percent. Recent studies show that unplanned downtime costs industrial manufacturers an estimated $50 billion each year, and reduces a plant’s overall productive capacity between five and 20 percent. AI can predict machine failures before they occur by accessing sensor-based time-series data produced by modern manufacturing equipment. Predicting failures before they happen allows operations to take proactive, corrective measures or conduct planned downtime for repairs, thereby reducing unplanned downtime and lowering costs while creating smoother and more stable supply chains. Last-mile delivery is a critical, and often the most expensive, stage in the journey of a product from fulfillment center to the final destination. According to CoreSight, last-mile logistics costs accounted for an estimated 53% of overall delivery costs in 2016. AI can deliver visibility into last-mile delivery, ensuring more consistency and accuracy. One way of optimizing the last-mile delivery routes and schedules, for example, is by employing geocoding algorithms that automatically map addresses into coordinates. According to 2017 Global Human Capital Trends Report, 41 percent of companies claimed to have investigated the adoption of cognitive and AI technologies. Chatbots, which are automated conversation tools, are already widely used in the customer service world. They are also being developed to interact with suppliers for tasks such as requisitioning materials, confirming shipping orders, issuing governance and compliance requirements, receiving invoices, and tracking late shipments. While so far, the trend has been in customer-company interactions, it’s only a short leap to bringing them into business processes to, for example, provide instant information on shipment status, stock availability, stock price, or the answers to other procurement queries. While the potential for AI in the supply chain is enormous, some industry professionals are concerned about its potential for reducing human jobs. But the reality is that, rather than replacing human beings, these technologies augment the roles of skilled workers, allowing them to provide more value to their organizations. AI technologies often perform the repetitive and boring tasks that most workers don’t want to do anyway. Rather than giving rise to mass unemployment, the advent of AI technology will simply shift employment needs in many industries. Artificial Intelligence technologies will still need careful monitoring, meaning that experienced logistics and operational professionals will still have a valuable role to play. 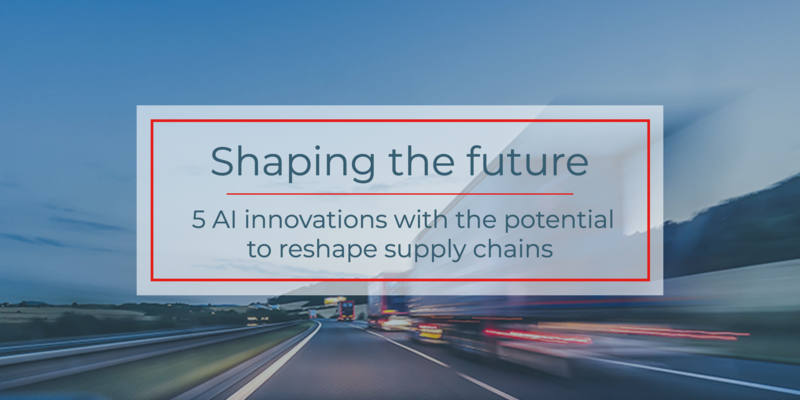 While these technologies show a lot of promise for the future, what can you do to optimize your supply chain operations today? Talk to one of our logistics experts at CAI Logistics to help you prepare for the future while making improvements that will help your company in the present.